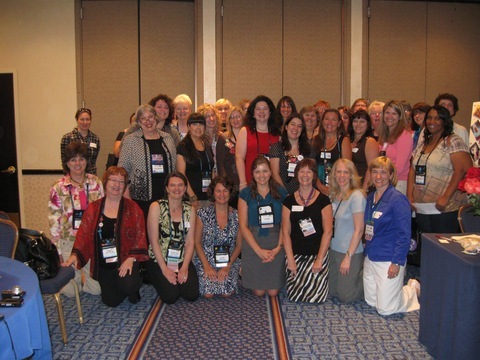 Golden Heart finalists at the RWA Conference in 2011. I attended my first chapter retreat–more like a mini writers conference–last weekend, and it was a blast. Great speakers like Robyn Carr, Elizabeth Boyle, and Diane Gaston told stories and inspired us, reminding us that every writer starts at the bottom. The Romance Writers of America national conference offers a quantity of content that’s hard to beat, along with the opportunity to meet writer friends I otherwise only “see” online. But I enjoyed the intimate nature of a much smaller local conference where it was easier to connect with people. And despite the conference size, we still had some amazing speakers and fantastic workshops. The workshops, as always, sparked some “aha” moments, but there’s nothing like talking to other writers to get your creative juices flowing. For me, that’s where the greatest value of these get-togethers lies. There were at least two separate instances where I had an epiphany in the middle of discussing one of my manuscripts with another writer. Those moments alone were worth the time and money spent at the retreat. But the biggest treasure was strengthening friendships and making new ones. In this solitary endeavor we can’t have too many friends who understand and support us. I was at a writers’ conference last weekend, too — Desert Dreams in Phoenix. Although I loved the experience at RWA Nationals last summer, this one was a lot more relaxed and intimate. I’d definitely go again next time … of course, I’m going to Anaheim this summer, too. I’d love to go to that one, Arlene. Maybe one of these days I can get a family visit to coincide with the conference. See you in Anaheim! I love writer’s conferences. They are real energy boosters. Will I see you in Anaheim? I agree, Kathy. I always come away more motivated than when I went. I’ll be in Anaheim. Hope to see you there!